Holiday Inn St. Catharines-Niagara hotel Saint Catharines | Low rates. No booking fees. 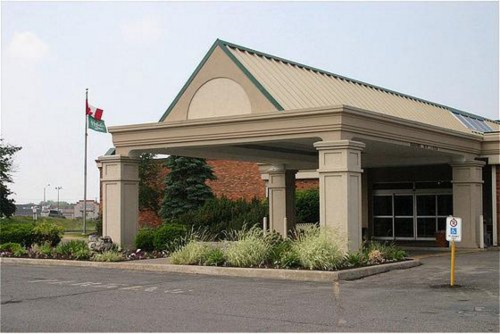 This hotel is located in St. Catharines, Ontario, facilities family, a short distance from Niagara Falls. It offers accommodation completely non-smoking restaurant and lounge on site. The Holiday Inn St.
Book a room at Holiday Inn St. Catharines-Niagara hotel Saint Catharines online and save money. Best price guaranteed! Holiday Inn St. Catharines-Niagara hotel Saint Catharines: low rates, no booking fees. The hotel is located at 2 North Service Road in Saint Catharines, Niagara Regional Municipality, Ontario, Canada – see Saint Catharines map ». Hotels in the neighbourhood of the Holiday Inn St. Catharines-Niagara hotel Saint Catharines are sorted by the distance from this hotel. In the following list, large airports nearest to Holiday Inn St. Catharines-Niagara hotel Saint Catharines are sorted by the approximate distance from the hotel to the airport. Airports near to Holiday Inn St. Catharines-Niagara hotel Saint Catharines, not listed above. In the following list, car rental offices nearest to Holiday Inn St. Catharines-Niagara hotel Saint Catharines are sorted by the approximate distance from the hotel. The following list shows places and landmarks nearest to Holiday Inn St. Catharines-Niagara hotel Saint Catharines sorted by the distance from the hotel to the centre of the listed place.